IBM DB2, you’re using, is one of the best relational databases on the market. However, whether it’s commercial-grade version or free DB2 Express-C, it is still susceptible to malicious outside attacks and insider vulnerabilities. DB2 firewall by DataSunrise is the ideal solution to most data security problems. It blocks unauthorized access attempts in real time. Due to advanced threat detection algorithms, it prevents SQL injection attacks as well. DB2 firewall by DataSunrise is complete database security solution. It offers a data-centric approach to securing sensitive and regulated data. It ensures security and integrity of critical business data preventing unauthorized access to databases and capturing SQL injections in real time. Stopping accidental data leaks, DataSunrise helps organizations to comply with the requirements of regulatory standards. DataSunrise feature data audit capability. It collects and logs information about operations performed, who and when performed the operation and all the attributes of the operation. Paired with special threat detection analysis log information it allows to capture suspicious traits signaling about potential data breach preparation. Functioning as a proxy, IBM DB2 firewall by DataSunrise intercepts all inbound and outbound queries filtrating them according to the security rules pre-defined by DBA or security managers. The firewall has a renewable set of threat patterns that are used to identify security threats and attack attempts. 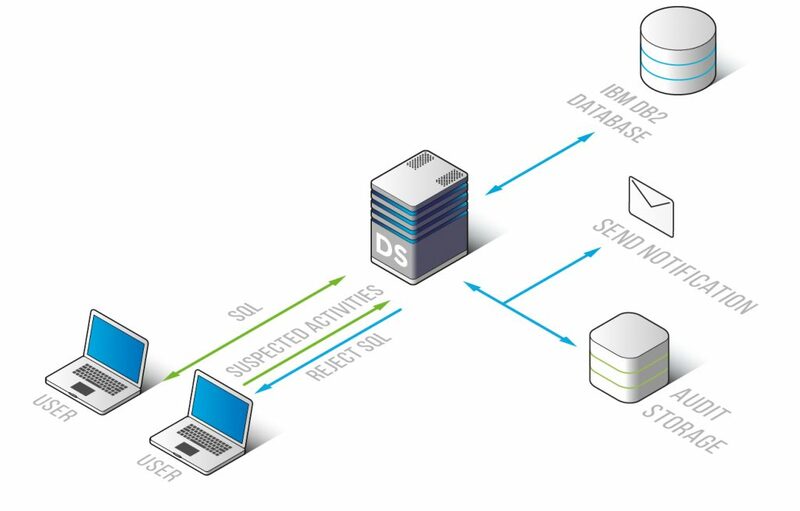 Still, not all database attack patterns can be recognized, that is why at the very beginning of its functioning, DataSunrise Database Firewall examines queries commonly used in a given environment in order to prepare a whitelist of SQL transactions. The firewall blocks all queries that are not on the whitelist. This kind of approach eliminates a great number of the threat possibilities. SQL injection vulnerability is the most commonly used and the most dangerous vulnerability. Thus DataSunrise firewall uses sophisticated algorithms to detect and block SQL injection attacks to protect your databases. DataSunrise firewall provides a highly available protection and can be installed on multiple servers with shared control settings. It is compatible with the most popular SIEM systems to build a max secure perimeter around your databases. With DataSunries you won’t have to worry about the performance slowdown. DataSunrise Database Firewall for IBM DB2 runs on Windows, Linux and supports IBM DB2 version 8+.